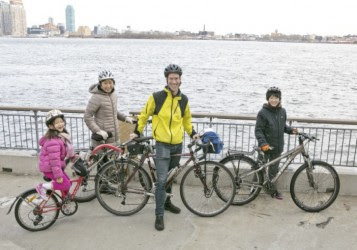 a note from apple seeds: Bike Adventures with Kids! Charles R. Scott, author and Family Adventure Guy, was recently featured on Get Out With Kids, a Family Outdoor Adventure blog from the UK! 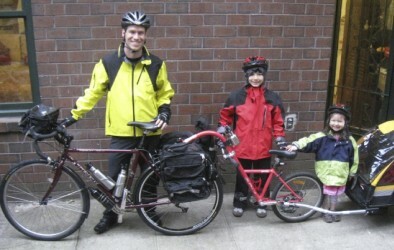 For the first family adventure (2009), I convinced Intel to give me a 2-month unpaid leave of absence to cycle the length of Japan – 2,500 miles – with my 8-year-old son, Sho, who pedaled on a trailer cycle connected to my bike. We carried about 75 pounds of gear, including a tent. The trip took us 67 days. 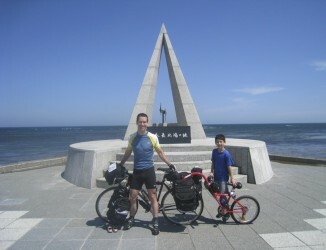 "With my 8-year-old son Sho at the start of our ride across Japan, we cycled over ten mountain passes." We cycled over ten mountain passes, took on sumo wrestlers, met remarkably friendly people and learned that a kid can do a whole lot more than most adults think. In the first week of our ride, Sho threw three major temper tantrums, and I worried that the trip was going to be too much for him. But after I told him that I couldn’t do the trip without his help and that he should think of himself as a team member, the temper tantrums disappeared. Sho rose to the occasion and did great over the following 60 days. I learned an important lesson: a child thrives with loving support and high expectations. Sho and I raised money for a global tree-planting campaign, received press coverage around the world, and were named “Climate Heroes” by the United Nations. I wrote a book about the experience, Rising Son: A Father and Son’s Bike Adventure Across Japan, and believe that the most precious gift a parent can give a child (besides love) is time. I returned from Japan and dove back into my busy corporate life, but started planning how to change my profession so that I could take more trips like these with my kids. Finally, in 2011, I ended a 14-year career at Intel and became a writer and family adventurer, taking my kids on endurance challenges linked to charitable causes and writing about the experiences. A week after leaving Intel, I flew to Iceland to cycle the circumference of the country with Sho, age 10, on the trailer cycle and my 4-year-old daughter Saya in a bike trailer. We carried about 100 pounds of gear and spent 46 days exploring Iceland’s rugged countryside. My wife Eiko joined us for the final 3 weeks of the ride. I was overwhelmed by Iceland’s remarkable beauty and the abundance of animal life. So much of the country’s natural environment remains pristine, but the effects of climate change are apparent. We talked with locals and scientists about the retreating glaciers and declining puffin population, and I wrote articles about our experience for the Huffington Post. I discovered another lesson: the more time kids spend in nature, the more connected they feel to the world around them, and the more they want to protect it. Last summer, my kids and I cycled across Germany, Switzerland, France and England. Saya graduated to the trailer cycle, and Sho rode his own bike and carried his own gear. This summer, my kids, now ages 6 and 12, and I are re-tracing the Lewis & Clark Trail in the U.S., cycling 1,700 miles from North Dakota across the Rockies to the Pacific Ocean. My wife will join us in the final week of the trip. You can track us on our blog here: http://familyadventureguy.blogspot.com.